The FX118 is a low-power, full-duplex frequency inverter available to provide voice privacy for cordless telephone systems by mixing the incoming audio with an internally produced carrier frequency (3.3kHz). 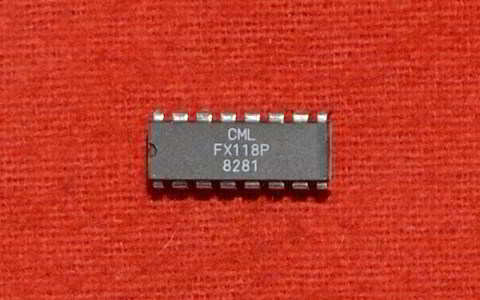 This chip contains two completely separate audio channels (C1 and C2) each comprising a “component-adjustable” input amplifier, a 10th-order lowpass filter, a balanced modulator and a 14th-order bandpass filter output. The on-chip modulation process has the properties of high baseband and carrier frequency rejection which when combined with high-order output filtering, produces a high-quality recovered voiceband audio. 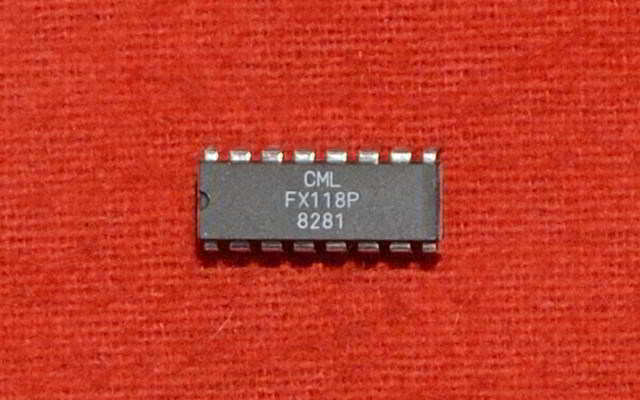 The frequency stability of the FX118 is achieved by an on-chip oscillator employing an external 4.433619MHz Xtal or clock input to produce the common carrier frequency and the sampling clocks for the switched capacitor low and bandpass filters. This microcircuit has a low power requirement of 3.0 volts (min.) and is encapsulated in either 16-pin DIL or small outline SMD (S.O.I.C.) plastic packages both of which are of a physical size suitable for either base or handset type telephone instruments as well as battery-portable and mobile communications systems.